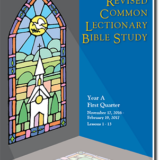 We have posted an example of a lesson from this year’s Revised Common Lectionary Bible Study for you to explore! Please click here or the image below to download this lesson as a PDF. Our Bible Studies are copyrighted material and may not be printed or reproduced without our permission, thank you! 18 Jun: What impact can this Bible Study have on your church? 14 May: Why Study The Bible?